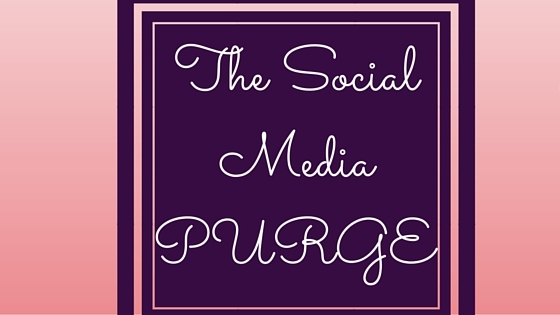 So today I'm talking about social media purging! Mostly about Instagram, because that's what I just did today, but this works for Twitter, Tumblr, Facebook, anything and everything! You will get rid of a big portion of your problems. If there are certain people who's accounts lead you to have a massive amount of FOMO, unfollow them! At the end of your purge, you will only be following people who inspire you, motivate you, and lead you to live your best life. For me, I knew that the majority of people that I needed to purge was the people that I followed, but don't follow me back. This will be different for everyone, though. So I went in, and started going down the line. The first people that I unfollowed were people that are not on the same page as me. So anyone that posts pictures of partying a lot, I unfollowed because that's just not what I want to see all the time. Then I went through the list again and unfollowed anyone that I didn't know too well, and that didn't inspire me. These were like the acquaintances I made in high school that I haven't spoken to since graduation. Lastly, I went through once more and double checked that everyone I'm following makes me happy. This is very time consuming, especially if you're like me and follow a ton of people, but it's so rewarding at the end when you realize how much excess clutter you got rid of! Like, I think there's a reason why Taylor Swift only follows 75 people... Next up, I think I'm going to do twitter. This is a lot harder because I follow sooooo many people on it, but it's definitely going to be worth it! Let me know how you like to social media purge in the comments below, and check out my instagram @miss_sienna! Ah, I totally agree with you! I recently did a purge on Instagram because I realized that I was following way too many stores and online boutiques. Every day as I scrolled through my feed, it was like advertisement after advertisement. Although all the clothes were super cute and unique, it became kind of a struggle because I already have a horrible shopping problem to begin with :\ Same with getting constant emails about sales from stores! it does! and I love seeing things that inspire me rather than the junk that sometimes accumulates in my feed! haha yes! I definitely need to go through my twitter next because I'm following way too many stores and I hate seeing so many offers in my feed! I just did this myself recently! yay! doesn't it make you so much happier when your feed is clean?